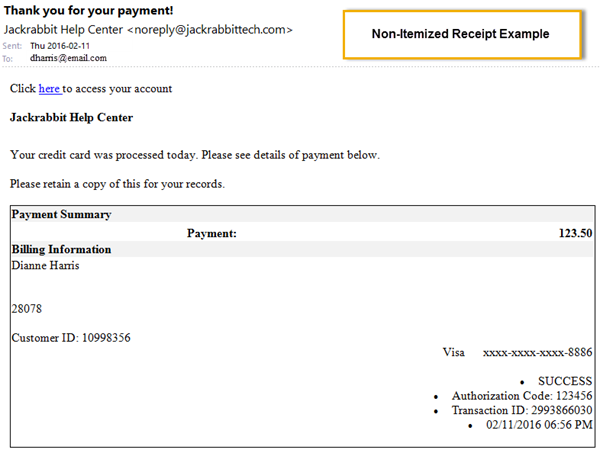 Jackrabbit automatically sends a receipt via email for an approved ePayment. You can also optionally send an automatic email receipt for a declined, voided or refunded ePayment. From Tools > Credit Card/Bank Account Settings > Receipts you can choose which ePayment receipts you want Jackrabbit to send automatically and customize the email subject line and header text for each type individually. Note: In order to see Credit Card/Bank Account Settings in the Tools menu the User ID must have the Credit Cards/Bank Accounts Settings permission in the Tools section. Edit User ID permissions from the Tools menu > Manage Users & Permissions. If you would like to completely suppress all automatic ePayment receipts contact Jackrabbit Support and a representative will be able to update your database settings to reflect this. Who Receives the Email Receipts? When using the Use Card/Acct on File button or Transactions >Process Credit Cards/Bank Accts, the email receipt is sent to the Contact who has Billing Contact set to Yes. When the Enter/Swipe Card button is used, Jackrabbit offers an option of sending or not sending an email receipt to the Contact with Billing Contact set to Yes and offers a field to send to another email address as well. Reply To Email - This email address will receive replies from emailed receipts. If this is blank, the organization email address will be used. 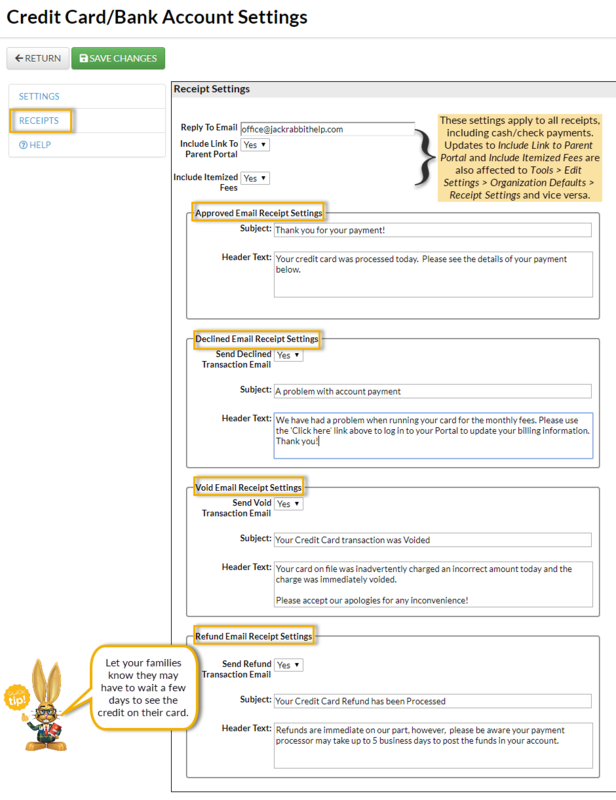 Include Link to Parent Portal - Select Yes to Include Link to Parent Portal as a Jackrabbit Best Practice. This will add a link to the Parent Portal with text directing the family to "Click here" to access their account. Include Itemized Fees - Change Include itemized fees? to No if you do not want your receipt to show all individual fees linked to the payment, this setting defaults to Yes. 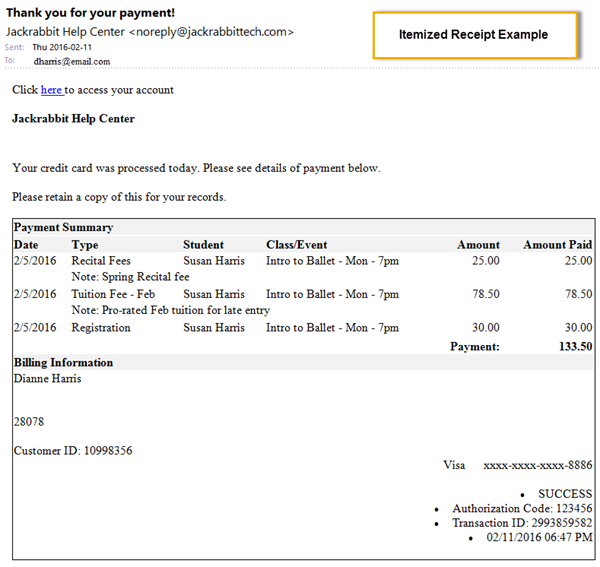 Approved email receipts are automatically sent by Jackrabbit. Customize the approved receipt with a subject and header text. Use the various receipt settings to select and customize the receipts your organization wants Jackrabbit to send automatically for credit card/bank account payments.